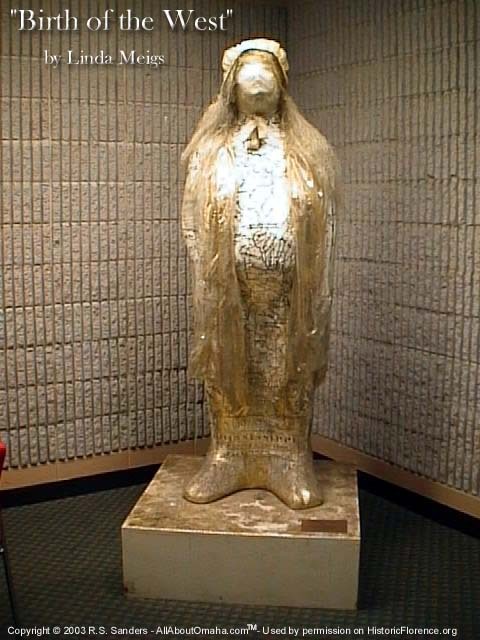 This sculpture was created by artist, Linda Meigs, as part of Omaha's 2001 J.Doe Project. It represents the historic westward migration of our nation. The figure is pregnant with promise. Her face is veiled...just as history is veiled by time. She is clothed with Major Stephen Long's 1823 map of the frontier, a pioneer sunbonnet, and materials representing the Overland Pioneer Trails of the 1840s to 1860s. Common dirt symbolizes a desire for land among Oregon Trail immigrants. Golden glitter symbolizes a desire for wealth by those following the Gold Rush. White iridescent fabric represents the faith of Mormon Trail immigrants. For thousands of immigrating John and Jane Does, the West began right here in Florence...on the western banks of the Missouri River. This J. Doe piece of art was sponsored by: Linda Meigs, Ann & Allan Mactier, American Gramaphone, Cubby's Inc., Holly Hackwith Corporate Art, Florence Kiwanis, Florence Community. The "Birth of the West" is located inside the Florence Library and Recreation Center. Initially, it was placed at the Bank of Florence for a while.